Kamala Khan may not be allowed to go to the school Valentine’s Day dance, but Ms. Marvel will crash it – in an attempt to capture Asgard’s most annoying trickster, Loki! 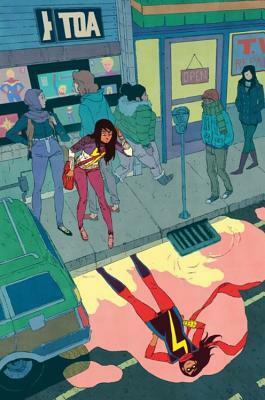 And when a mysterious, and really cute, stranger arrives in Jersey City, Ms. Marvel must deal with…a crush! Then, it’s the moment you demanded, as Ms. Marvel meets her idol: Carol Danvers and Kamala Khan battle side by side! The Marvel Universe’s last days have arrived, but Ms. Marvel has no time for silly things like armageddon – she’s got to rescue her brother and keep her city from falling into chaos.